Now that a new season in the National Football League is upon us, we are once again able to enjoy the feats of speed, power, strength and skill displayed by the stars of the game from week to week. Fans will argue back and forth over whose team is superior, citing the depth of their rosters, the experience of their coaching staff and the arm of their quarterbacks. The success of a team will depend on numerous factors, many of which are beyond the grasp of the average fan. Because football is such a physical and brutal game, and played over a minimum of 16 regular season games, the physical preparation of the players will have a significant bearing on the success of the team over the duration of the season and into the playoffs. Good physical preparation will not only translate into performance gains, but also resistance to injury. Given that adequate strength and conditioning must be accumulated over a significant number of weeks in the off-season in order for the benefits to persist over the season, we must take a closer look at what players are actually doing during the off-season period. Phase 1 – The first two weeks of off-season training involves “strength and conditioning and physical rehabilitation only.” Only Strength and Conditioning coaches are allowed to work with the team, with no live footballs, helmets or pads allowed at any time. The intent is that only conditioning activities will be permitted in an effort to progressively prepare the athletes for more intense activities in later phases. Phase 2 – The next three weeks of off-season training permits all coaches to be on the field of practice. Permitted activities include on-field work, including individual and group instruction and drills. Practices are helmets-only, with no live contact allowed. Offensive, defensive and special teams units can work together, but not against an opposing presence, and no one-on-one offense-versus-defense drills are allowed. Strength and conditioning activities are continued through this period. Phase 3 – The final four weeks of off-season training can include on-field work, including individual and group instruction and drills. A maximum of 10 organized team activity (OTA) days are allowed, with no more than three days during the first two weeks and no more than four during the third week. In this phase, football is the main concern for coaches, with strength and conditioning activities taking a back seat. Although one would hope that strength could continue to be developed during this four-week period, it is likely that only strength maintenance can take place given the demands of the on-field work. 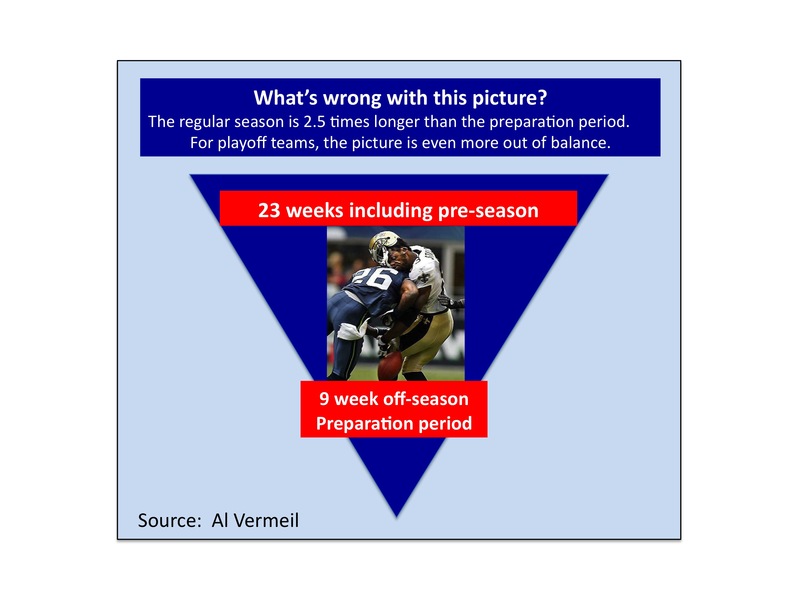 With only nine weeks for supervised physical preparation in the off-season, coaches must make sure that every bit of contact time with the athletes is optimized. Players will have a minimum of 16 weeks away from the coaching staff during the off-season. A good deal of de-training can occur during such a long time period, particularly if no quality training is undertaken. Ultimately, on-field performance will suffer and the probability of injury has the potential to increase significantly. Given the potential for athletes to arrive at training camp out of shape or inappropriately conditioned, the coaching staff must look at alternatives for ensuring their players are ready for training camp and the regular season. The situation will vary from team to team, but there will likely be a portion of the team that needs alternative strategies for ensuring their conditioning is bolstered in the off-season, as well as accentuated for in-season. Simply slapping fines on players or chewing them out will not suffice. My good friend and physiotherapist at Professional PT in New York, Rob Panariello, made a very good point the other day. He noted that the contracted off-season conditioning requirements for the NFL would necessitate that teams make better use of their in-season strength and conditioning program to not only maintain strength, but also build it over the course of the season. A good in-season program may be the difference between being a playoff contender and hitting the golf course early. Given the time and energy constraints in-season, special care will have to be taken to find methods for optimizing training adaptations in-season to get an added advantage over other teams. a. Maximal strength gains via electrostimulation come at little or no stress on the Central Nervous System (CNS). Thus, athletes can put in more work and still feel fresh and alert for other tasks. b. Muscular strength can be improved with minimal stress on the joints and associated connective tissues. Many athletes complain of shoulder, elbow, ankle, knee, neck and hip pain from week to week. While conventional resistance training may exacerbate these problems, electrostimulation can train the muscles without stressing the joints further. And, by strengthening the muscular system, joints are provided with significantly more support from game to game. c. Electrostimulation devices with massage and active recovery settings allow players to recover faster by enhancing circulatory mechanisms and flushing out waste products that collect in the muscles after games, practices and training sessions. d. Electrostimulation allows the team to multi-task during their strength workouts and recovery sessions, creating a more efficient environment from week to week. Players can still review their playbooks, watch film and discuss strategies with coaching staff and fellow players while a portable electrostimulation unit is connected to their muscles. e. Work can even be accomplished during travel on an airplane or bus. A portable electrostimulation unit can be attached to players’ legs during a long flight to enhance circulation and keep blood from pooling in the lower legs. Active recovery and massage programs can loosen tight muscles in the hips and back for long periods of inactivity and sitting. This is particularly important in a post-game scenario when athletes are on the road and have to head back to the airport soon after the game. Rarely is enough time prepared for cool down and active recovery. Electrostimulation can accelerate recovery in a scenario that may initially appear sub-optimal. f. For athletes who sustain injuries during the season, use of electrostimulation can preserve or improve their strength throughout their rehabilitation and recovery. A common injury in football is an ankle sprain. Even though some athletes may not be able to place any weight on the injured side, they can still use the electrostimulation on the quadriceps, hamstrings, glutes and calves of the injured leg. Once the ankle has healed appropriately and the athlete is ready to practice and play in games, they will have not lost any significant strength in their lower extremities. In essence, they can hit the ground running. The benefits of an electrostimulation program for in-season applications are obvious. For the most part, a strength coach can attain significant gains in-season with his players by simply having them sit down and allow the electrostimulation units to do the work for them. In some sessions, the athletes will be improving general strength capabilities. In other sessions, the electrostimulation units will speed up recovery and loosen muscles. Legendary strength coach, Al Vermeil, made another good point to me about introducing electrostimulation in-season for NFL athletes. The added benefit of educating athletes on the benefits of electrostimulation and taking them through the process of using a portable electrostimulation unit during the season is that these athletes will now be equipped to use electrostimulation as part of their off season training. High quality portable electrostimulation units are available for anywhere between $500 and $1,000 – well within the budgets of professional athletes who are motivated to improve off-season conditioning. In fact, a number of NFL teams and athletes are already using Globus electrostimulation devices for both in-season and off-season applications. While the benefits are apparent, there is still the obstacle of getting players to do something new. Many players are of the mind that they want to only do what they are “required to do.” When playing football, or any professional sport for that matter, becomes a job, it is common for players to “punch the clock” when the day is over. With the average career of an NFL player lasting approximately 3.5 years, it is in the interest of the players and the team to look at simple ways to improve their chances of extending the length of their career and the overall quality of time in the NFL. It is important to note that electrostimulation should not be relied upon as the sole source of strength training for an athlete. While electrostimulation can elicit strength gains in individual muscles equal to conventional strength training, it does not provide the inter-muscular coordination elements introduced by conventional training exercises such as Olympic lifts, plyometrics and sprinting. 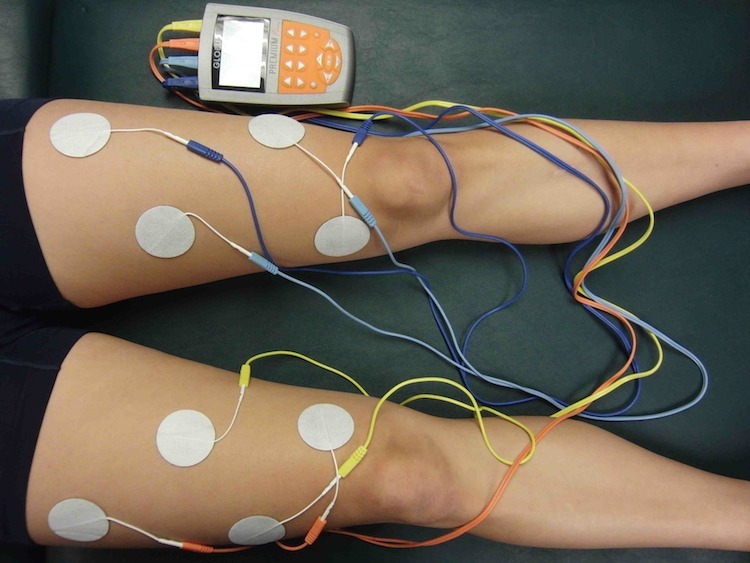 Electrostimulation should be viewed as a supplement to an athlete’s regular training regime. While electrostimulation is no magic bullet, it can be a simple add-on to an existing training program that needs an edge on the competition. A simple investment of $20,000 by a team could provide them with 20-25 electrostimulation units that could be used by the entire team in an effective manner throughout the season and off-season. Given that the average NFL team is worth close to a billion dollars, $20,000 seems to be a safe bet. In a future article, I will present strategies for implementing electrostimulation sessions during a typical in-season week for football. Due to the versatility of many of the new electrostimulation devices, with strengthening, recovery, loosening and warm-up/potentiation protocols, sessions can be performed every day of the week, leading right up to game day. The volume of use need not be high to get a profound effect, particularly if you are strategic with your application of this technology. Click on the Player below to hear the podcast, or download it to your phone. 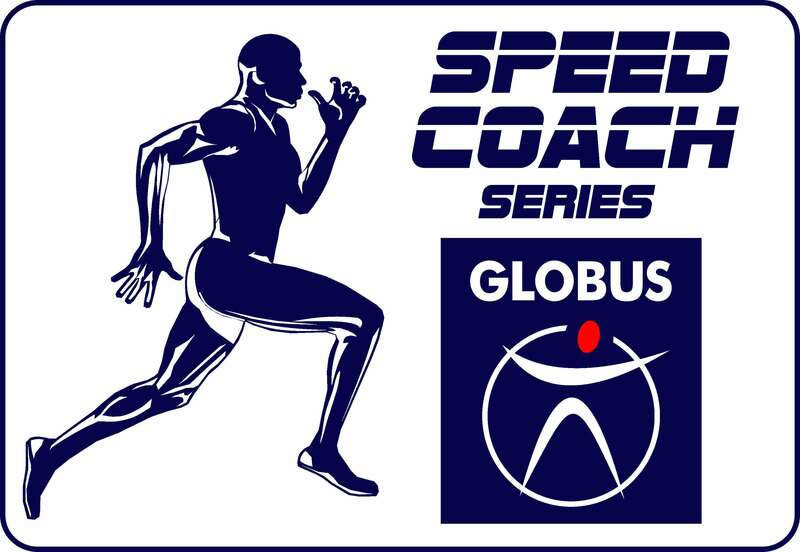 Visit our store to learn more about the Globus SpeedCoach electrostimulators used by a number of teams and players in the NFL. Derek is an International Sport Performance Consultant that has been working with athletes in speed, strength and power sports since 1988. He has worked with some of the top performers in the world as a coach and a consultant – including Olympic medallists, world record holders, Canadian National team athletes, and professional athletes from numerous sports. He also serves as a performance consultant to numerous professional teams and NCAA Division 1 programs throughout North America.